Cucumber is a widely cultivated plant in the gourd family. It is a creeping vine that bears fruits that are used as vegetables. 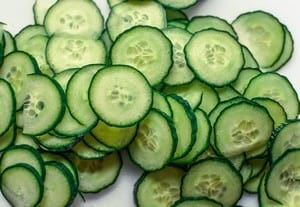 Raw cucumber (with peel) is low on nutritional value since it consists out of 95% water. Rabbits can eat the peel, leaves, and seeds of the cucumber plant. When serving, first rinse under some running water and then cut into smaller slices. In terms of portions, consider a couple of slices as part of the daily fresh vegetables. There is a good change your bunny won’t even like cucumbers. It is listed as one of the vegetables rabbits will not eat. This is backed by a number of accounts we found where owners mentioned their rabbit avoids cucumber altogether. Conclusion: it’s fine for rabbits to eat cucumbers. However, chances are your bunny might not like them. What is your experience with offering cucumber to your rabbit? We’re curious to find out.